We started in 1989 with Mr Kraanen selling pottery from a small premise's, the business has gradually grown over the years and now sells a huge variety of garden ornaments from small to large pieces, trading as Dutch Imports & Daughters Ltd. This is a short version It all started back in 1958 with my mum and dad coming across from my native Holland on buying trips for antiques to retail and wholesale back in Rotterdam. I was the latest addition to a large family, growing up in those days gave me a good understanding of antiques and styles etc....So when I started my own wholesale business in 1989 it helped me greatly. Some of the repro items we see today I now recognise from my parents having the originals for sale in their shops all those years ago. I recently came across a picture from my mum and dad’s shop in the picture you can see an original copper top, we now sell a reproduction of this item some 50 odd years later! I came across from Holland in 1976 with my dad helping with antiques and that is when I met my wife and I never went back, but that’s another story... We get asked a lot why we are called Dutch Imports, well most of my buying when I started was from Holland but since then things have changed and most of our items are bought from the far east, we try to be different from our competitors and look for good quality, different and unusual items. 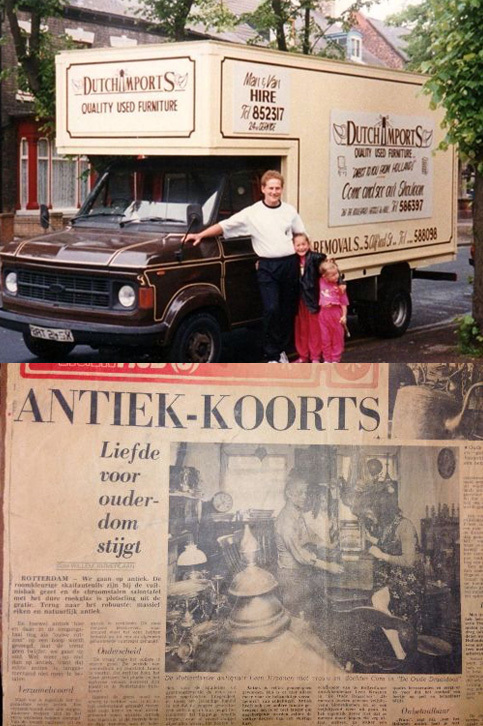 The Business has expanded over the years and 12 years ago my daughters decided to join forces with me which leaves us where we are today, Dutch Imports & Daughters Ltd.